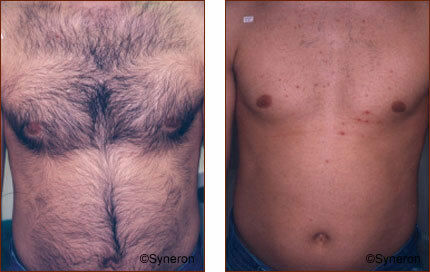 Hair Removal is one of the top five most popular non-invasive procedures. Powered by the revolutionary elõs Technology, Syneron Hair Removal systems are setting new standards of speed, safety, and efficacy, in the removal of even minimally-pigmented hair colors, and all skin tones, including tanned skin. Using revolutionary elõs Technology, our systems first preheat the target using optical energy, which creates a thermal path on which the radio frequency (RF) travels. RF is delivered directly to the hair follicle, which can not conduct RF. The buildup of current density results in 4x heat coefficient thermal transfer. Under 80X magnification, distinct peri-follicular coagulation or bleaching is evident. The hair follicle is terminally disabled and denatured. How does Hair Removal with elõs™ DS/DSL Applicator work? The DSL uses laser and bi-polar radio frequency energies to damage the hair follicle. This disables the follicle from growing hair, which means that gradually over several treatments, there is a permanent reduction in the amount of hair in that area. What is the advantage of elõs hair removal systems? There is no exclusionary criteria based on skin type or hair color (the treatment approach for apigmented hairs is different than treating dark hair and the response rate may be less predictable). How efficacious is the treatment? In a study which included skin types II-V showed 35-42% clearance 3 months after a single treatment. Post treatment hair extrusion occurs around 2-3 weeks. Some hair shafts can be pulled out of the follicle immediately post-treatment without resistance, indicating disengagement from the follicle while the hair shaft is still intact (i.e. has not been singed by the laser heat)- the bi-polar RF energy effect is clearly evident. Treatment is very safe for the skin. There are many advances in the technology that make elõs one of the safest hair removal systems available for all skin colors. There are no long term health hazards from laser or electric energies used in elõs. Both optical and radio frequency have been used for decades in medicine, surgery, and aesthetics without adversity. Everyone has different pain tolerances but most patients are treated without topical anesthetic creams. The chilled air device, SynerCool™ is very helpful for discomfort during treatment and especially when fast, auto-repeat firing is used for large treatment zones. What results can one expect from the elõs treatment? Each DS/DSL treatment will result in less hair coming back, as well as hair growing progressively lighter in color, finer, and slower-growing with each treatment. It takes more than 1 treatment to affect all the follicles growing in an area. Most people achieve satisfactory clearance after 6-8 treatments, but individual results vary depending on medical and genetic factors. Lighter colored hair may require more treatments than darker colored hair. How frequently does one need hair removal treatments? The treatments are usually performed every 2-3 months, but this depends on individual factors. Temporary pinkness in the skin lasts a very short time, and most people return to work or normal activities immediately after treatment. The treated area will “shed” some hairs over the next 2-4 weeks; you may experience a period of hairlessness in the area while you wait for your next treatment. Who should get treatment for Hair Removal? Anyone who wants a permanent solution to shaving, waxing, plucking, or electrolysis. There are few medical conditions that contraindicate people from treatment. What is the average number of treatments for elõs hair removal, dark hair? The average number of treatments is 6-8 to achieve satisfactory clearance, but some patients may require more or less. 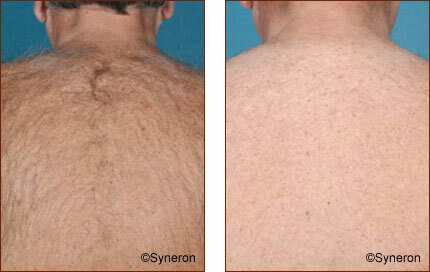 Men’s backs and chests, facial hair and hormonal hair take more than the average number of sessions, usually 8 or more. You may also be interested in the following procedures Medical Grade Skin Care, Skin Rejuvenation or ReFirme.